Join the Arion Donors’ Circle and take advantage of exclusive privileges throughout the year! Would you like the amount of your contribution for the activities and projects of Arion Baroque Orchestra to be doubled ? Get information from the human resources department of the company where you work to find out if they have set up a matching-donation program. 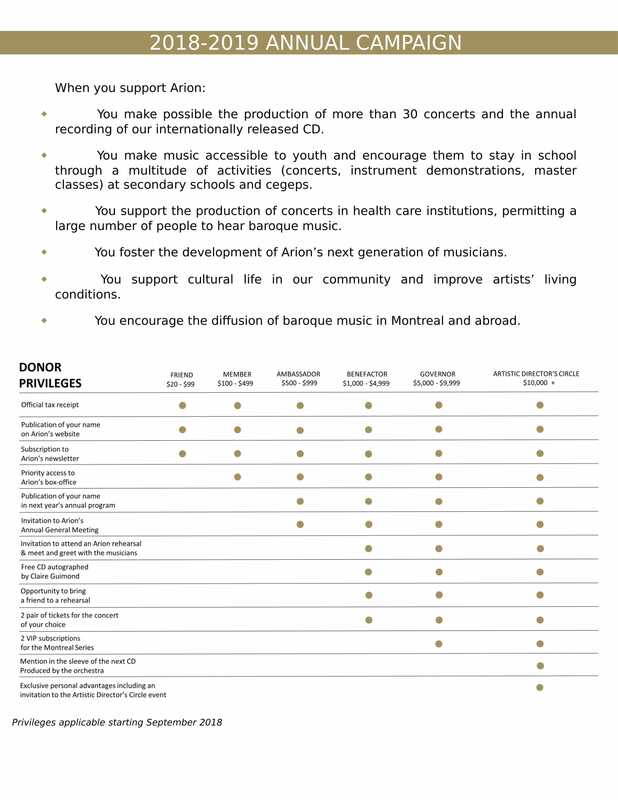 That way your employer could make a donation equivalent to or greater than your own contribution to Arion Baroque Orchestra. You are making your first donation? Take advantage of the First-Time Donor Super Credit from the Canadian Revenue Agency and Revenu Québec! Donations under $1 000 or over $5 000 could get you extra tax credit. For further information, please contact us. Thank you to all our 2017-2018 donors!